Today is World Oceans Day! This year’s theme is Our Oceans, Our Future. This one day global event celebrates all things related to the oceans and recognizes how vital the seas are to our survival. There are many ways for people to get involved, by participating in one of the events, pledging to use less plastic, or simply by appreciating an ocean view and the creatures that live within it. 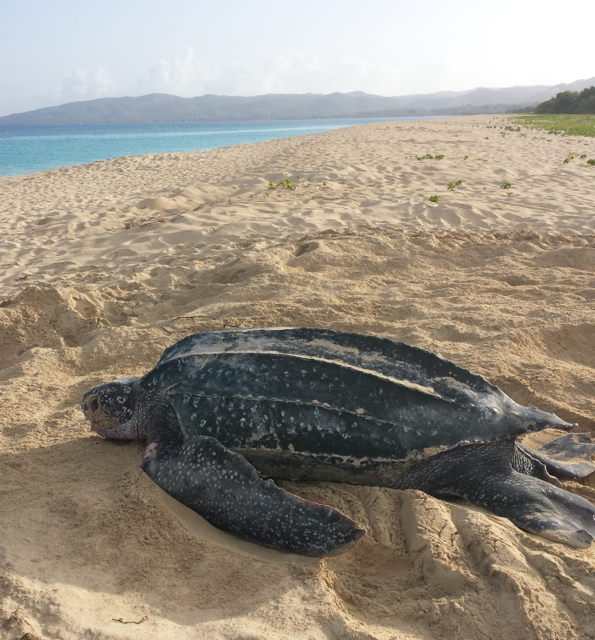 Here at Sandy Point, we are focused on protecting sea turtles that use this beach for nesting. Right now we have leatherback hatchlings emerging from nests that were laid two months ago – the eggs have been incubating in the sand and now the hatchlings are ready to get into the ocean where they will spend the rest of their lives. Here our team protects the hatchlings that emerge at dusk. There are birds and crabs that are ready to take a hatchling in the blink of an eye. These little hatchlings will return to this beach once they grow up and are ready to lay their own eggs. This is how we’ll be spending World Oceans Day! Hope you have a wonderful day celebrating, whether you are by the seaside or simply dreaming of it! The Cottages nest hatched on 5 June!